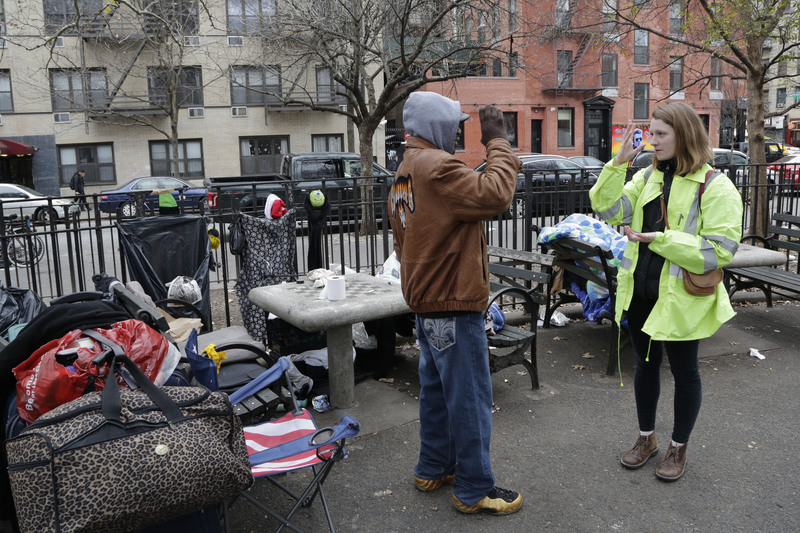 New York - As members of the city’s new homeless outreach team fanned out Monday for the first time to get people off the streets, three homeless New Yorkers filed paperwork to sue, saying police wrongly tossed a birth certificate, Social Security cards and priceless family photos into a dump truck. Jesus Morales and two others say they were sleeping in an encampment outside a school in Manhattan at about 5 a.m. on Oct. 2 when police and a sanitation crew arrived, woke them, told them they had to move and tossed their stuff. Some said they were kicked and shoved by the officers. “They grabbed my clothes and threw it all in the garbage truck,” Morales, 42, said in Spanish on Monday at a news conference, attended by about a dozen homeless New Yorkers, to announce notice of the claim. Morales said he’s been homeless nearly 16 years. A spokeswoman for the mayor said the encounter between the homeless and police involved illegal trespassing on school grounds. “That said, we will review our protocols concerning the seizure and disposition of personal property to ensure that it can be reclaimed by its rightful owners,” spokeswoman Karen Hinton said. Mayor Bill de Blasio said Monday that the city has had success in persuading some who live in the camps to accept city services. But homeless New Yorkers and advocates said they were concerned the mayor’s approach is too aggressive. Linda Lewis of Picture the Homeless questioned what would happen if all 55,000 homeless citizens were sheltered. “Then what? There isn’t enough housing for them — where do they go after shelter?” she asked. Some homeless said they preferred the streets to shelters, where they felt unsafe. An audit by the comptroller’s office found too few employees oversee the nonprofit organizations that operate shelters. Meanwhile, about 50 outreach workers from three nonprofit groups canvassed Monday as part of the city’s Home Stat outreach program. Allison McCullough of the Goddard Riverside Community Center interacted with about 10 people by midday, and one conversation was cut short when police arrested a man on an assault charge. She said connecting on the street is a challenge. She spoke with 30-year-old William Hardnet, who has been homeless since he was laid off from a cooking job at an Atlantic City casino six years ago. He said he prefers to sleep in a convenience store doorway than to go to a shelter. Still, he said, he plans to work with McCullough. Its the old story ....When a private citizen does something wrong ...Bang , a fine ect !!! When a city employee does something wrong ..... " We will review our protocall ". The more help given to the unfortunate = more and more of these people coming to the city for freebies there has to be a way to help only those who have been here for years or everybody that needs in the U.S. help will show up here.there used to be workhouses for those who were needy , a bed and meals for work. Now homeless people can earn an income: sue the city! Send them all down south where its warmer on the streets and prices of everything are so much cheaper. Give them a city job - cleaning streets would be a good start, and its a win-win for everyone.